The Buffalo News put me on the front page today because of this interview I did with Doc Severinsen in which Doc blasted this new book on Johnny Carson. I am so honored! 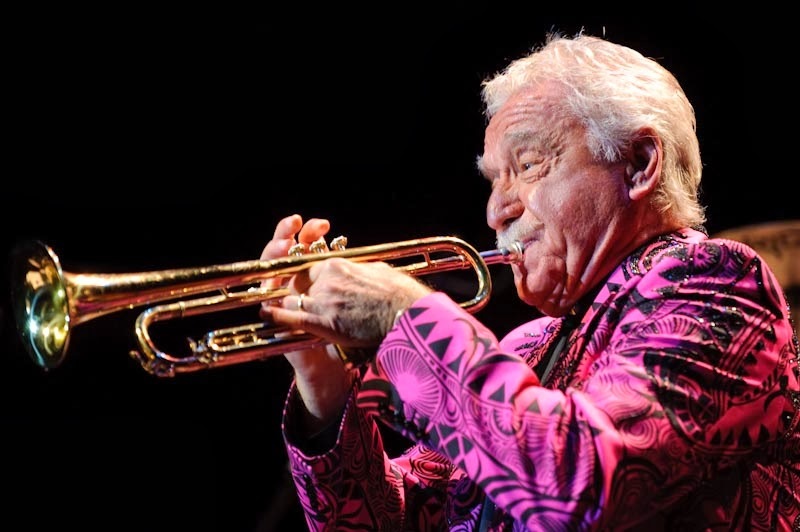 I called Doc Severinsen the other day to talk about his upcoming concert with the Buffalo Philharmonic Orchestra called "Solid Gold Doc." Oh, wait! Doc Severinsen called me. That is a sentence I loved writing so let me write it again: Doc Severinsen called me. The funny thing is, although I had in mind to ask him about this Johnny Carson book, because the book has been getting so much press, it took me forever to get to it. I have never been much of a TV watcher and I literally do not know if I could pick Johnny Carson out of a lineup. I mean, a lineup where they give you a bunch of guys who sort of look alike. My thing is music. So for half an hour Doc Severinsen and I discussed other things. Things that I will get to write about in a separate story running in the paper on Tuesday. Like the Tommy Dorsey band. He toured with Tommy Dorsey which I find fascinating and I wanted to find out about Tommy Dorsey's personality and what he was like to work for. We got onto Gershwin and I asked him if he had known Leonard Pennario. Ha, ha! That cannot be a question he gets asked too often. Anyway, he was very generous with his time and after half an hour or so I began to worry that he might get called away or something and I would not have asked him about the Johnny Carson book, which I thought I should. So I asked him about it. He was very nice and, to tell you the truth, even seemed to welcome the question. As one commenter wrote on The Buffalo News' site, Doc Severinsen is a class act. And now he has even put me on the front page! He can call me any time! Yes, yes, and Severinsen is very easy to work with. I should know. I saw him last about four years ago and he blew some pretty high notes. Two or three fell on the floor at rehearsal but he hit everything in concert. He never worries unnecessarily and THAT is cool. Violinhunter, I love the image of the notes falling on the floor. And that he hit them in concert! It doesn't surprise me. I've been reading the reports of Doc's recent concerts with his big band, and from what I hear, they're unbelievable. Doc is raising the roof! At 86!! I can't wait for his concert in Buffalo. I've never heard him with his band. Agree that it is a most excellent thing in a person not to worry unnecessarily.